It has been brutally hot the last couple days. Minnesotans are not used to this heat. It was over 100 degrees here at the lake today. Southerners may thrive in this heat and humidity. But true Minnesotans tend to wilt. Including me. I have often said that when it gets cold, you can always put on more clothes. But when it gets hot, no matter what your personal limit is, there is a limit to how much you can take off! So today it was work in preparation for a family get together on the Fourth. And then when it became unbearable, take a quick swim to cool off and then back to work. That is take a quick swim when the loons "allowed" me to take a quick swim. Not that they really prevent me from going in the lake. It is just that I hate to do anything to disturb them when they are near. And they are 'near' quite a bit! Much more than I have ever seen before. And it is all due to our chick who seems to like the nest so much that he still gets up on it several times a day. Sometimes he is on for just a short time before he leaves. And other times he is on the nesting platform for an hour or two. He usually sits on the edge of the platform. Or in the shadow of the irises. While he is on the nest, the adults just have to sit and wait for him to decide when he has had enough. A few times the adults apparently decided that they had waited long enough and they just swam off into the lake. Leaving the chick behind. But he seems perfectly happy to stay all by himself on the nesting platform. Or to just swim and float by himself near the dock. It is a different year that is for sure. Such different behavior and so much to learn. 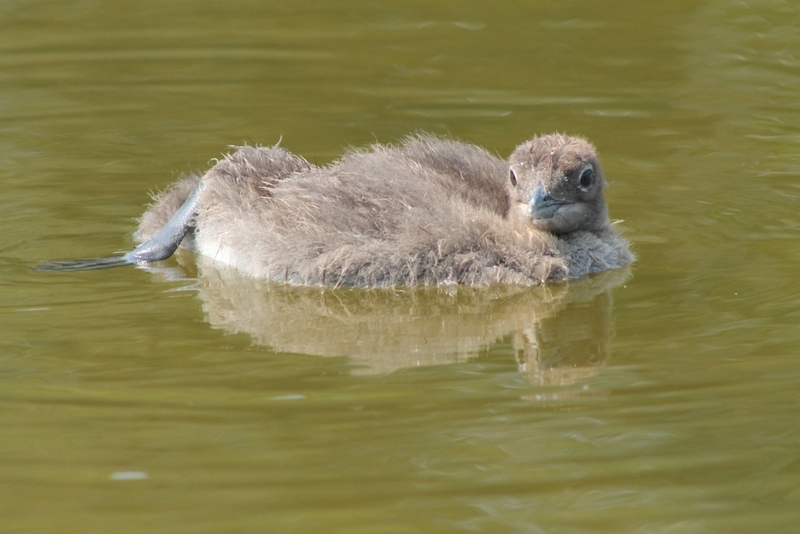 This morning was one of those times where the chick was contentedly all by himself flaoting near the dock. I decided to take the camera down to the lake and see if he would let me get some pictures of him. Not only did he let me, he seemed to be a willing participant in the photo shoot. As I walked out near the end of the dock, I expected him to swim away. But not our chick! I talked to him as I walked out slowly and quietly sat down on the edge of the dock. He was no more than 20 feet from me. And he could have cared less. In fact, he came swimming toward me. At times he was no more than 10 feet away. Sometimes he was so close that I had to back off the zoom because he more than filled the picture. He would foot waggle. He would preen. Three different times he even put his beek under his little wing and tried to sleep. But the eyes would not stay shut for very long. Not more than a few seconds at a time. And then they would open. It was as if he was playing peek-a-boo through the tousled mound of brown down. He reminds me of a teenager with the tousled hair of 'bed head'. So I am happy to tell you that our little chick - who is not so little anymore - is healthy and doing well. Even if he does have a very independent streak in him. And here is one view of him from this morning. I need to play with the color balance some because the down is not quite that light as this picture shows. But I was lucky enough just to figure out how to post this picture (that I think you can click on for a full size picture) so I decide to leave well enough alone for now. At least this gives you a picture of our little chick from just this morning. He is 4 weeks and one day old today. Oh how he has grown. There does not seem to be much question of who rules the roost in this loon family. Our little chick is the one who decides when he wants to come back to the nesting platform or to stay near the dock. I told a neighbor the other day I am not sure who is crazier, me or the loon chick. When he is on the nesting platform, I am saying "Will you please get out of here and go out in the lake and be a loon like you are supposed to be?!" But then when I do not see him on the nest or near the dock, I get worried if he is ok and I say "Will you get back in here where you belong?!" Oh what these little loon chicks can do to a person!